This topic is intended for X_TRADER users who want to learn how to calculate implied prices and quantities and how the X_TRADER implied engine operates. A direct price is the price of an explicit order. An implied price is a tradable price that is synthetically generated from orders in outright contracts and spreads. Tip: Implied prices are derived from direct prices. Without spreads, implieds would not exist. Spread traders simultaneously buy one contract and sell another. The premise behind spread trading is that you can profit from changes in the price relationships of different contract months of the same product or different products. We use the term spread trading because you are trading the price spread between two markets. 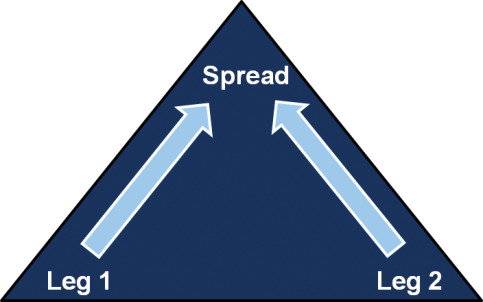 The legs of a spread are the underlying contracts in the spread. For example, in the April – May Crude Oil spread, April is a leg of the spread. The legs of the spread are sometimes referred to as the underlying or outrights. Implieds are really a simple equation with three or more variables. For any implied price, there is at least one unknown variables. Implied Ins. For more information, refer to Calculating Implied Ins. Implied Outs. For more information, refer to Calculating Implied Outs.